"I scream, you scream, we all scream for ice cream", is based on a historical fact, the creation of the chocolate ice cream bar. Also a second song: "0h my! Eskimo Pie" with words and music by Walt Wimbrow. In 1919 in Onawa, Iowa, a candy store owner Christian Nelson saw a customer could not makeup his mind between ice cream and a chocolate bar . When told to purchase both, the boy stated that he only had money for one. The idea was born to mate ice cream and chocolate. The ice cream that was born that day was called: "I - Scream Bar" and the first 500 hundred were taken to the Onawa Fireman's Tournament and quickly sold out. Christian Nelson had the product patented, but could not figure out a way to make and sell large numbers of the bar. He met an ice cream supervisor by the name of Russell Stover - who felt the name should be changed to "Eskimo Pie" which would have a better marketable brand name to advertise to the public. A third man entered the picture R.J. Reynolds who owned the US Foil Company. "Eskimo Pies" were now wrapped in a foil wrapper. An individual could hold the chocolate covered ice cream with the foil wrapper. In one day in 1921, in Omaha, Nebraska, one quarter million "Eskimo Pies" were sold. The original bar weighed 1 1/2 ounces. . The three men went onto become millionaires in other businesses. Nelson remained with ice cream, Reynolds of course remained in foil and Russell Stover opened candy shops and then marketed the famous Russell Stover line of boxed candies. Of course ice cream had been around prior to 1919. The ice cream cone appeared in St. Louis in 1904 at the World's Fair. But as with many inventions there are always many stories and theories of who invented the ice cream cone. At the 1904 Fair there were at least 50 ice cream booths and as many waffie makers booths. Each day over 5,000 gallons of ice cream was consumed. By 1924 Americans were eating 245 million ice cream cones a year. In 1946 the first year after the war, it was estimated that the average person in North America was on an ice cream binge - consuming 20 gallons a year . Other achievements along the way including Christian Nelson discovering that dry ice would allow ice cream to be transported long distances. This meant that not as many ice cream plants were required. This development allowed the appearance of the local ice cream on streets in their trucks. The famous Good Humor ice cream man was born. In his open air truck ringing the silver bells letting kids know that treats were at hand. Of course mothers were not always pleased if he made his appearance prior to dinner or during dinner. In my collection of ice cream I have a early 1930's photo of a Good Humor truck at an airfield on Long Island, New York. He is transferring ice cream to the plane for a flight to an unknown destination. With the explosion in ice cream marketing and different brands and companies - an entire collectibles area was born. Ephemera items include ice cream cartons, lids, paper hats worn by the famous soda jerks, advertising, booklets, World's Fair items, picture cards of both types - those given out by the dealer at point of sale or the others that were found under the lid of the ice cream - Dixie Lids. In addition - spoons - made of wood with the company name and others that were given out as premiums or designed especially for the ice cream. Items connected to the soda fountain - ice cream scoops - metal and plastic. Chairs from soda fountains, items from the soda fountain itself, depression ice cream dishes that came with metal frames to hold the dish in place. There are thousands of items and many are very inexpensive. The world of ice cream collectibles is unlimited. One can collect material connected to the major brands, brands of the past, and the many small local dairies that are still in business or have expired. In addition companies had premiums, Popsicle had trading cards, either given out by the dealer or distributor or could be redeemed with a certain number of wrappers. Ice cream is similar in developing a brand to encourage repeat customers and part of that strategy was to give away an item connected to the product. Not free, but provided upon purchase or through a redemption program. As a kid growing up my local ice cream dealer was a small local operation, but when purchasing product he would give baseball cards as a reward. What different types of ephemera exist? 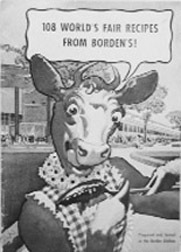 Fans - Borden's Ice Cream gave away fans which featured the famous Elsie the Cow. The fan featured Elsie on the top of the Borden's logo and above the slogan: "If It's Borden's It's Got To Be Good". The fan is 12" X 7 1/4". If one attended the 1939- 40'5 New York World's Fair - a visit to Borden's Diary World of Tomorrow was a must for every visitor. Elsie the Cow and her husband Elmer were in attendance every day. A booklet of 108 World's Fair Recipes from Borden's was available at the Borden's booth. Pages 5- 8 were ice cream recipes. Even one for coconut ice cream. Even into the late 1930's many families still made their own ice cream from ingredients purchased from dairies. Ice cream recipe books are a sub area of collecting. 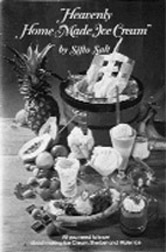 Companies gave booklets away that encouraged the individual to purchase their cream, or flavor to employ in making ice cream. Ingredients for homemade ice cream was another area of collecting. The ice cream maker has been sold since the 1800's and even continues today. The big difference is that many sold on today's market come motorized. The original makers and even into the 1970's employed the old human crank method of making ice cream. 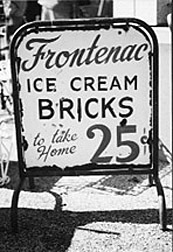 Companies such as the J. E. Porter Company of Ottawa, Illinois, "The World's Largest Distributor of Home Ice Cream Freezers" distributed "Recipes for Making Old Fashioned Ice Cream and Frozen Desserts". Good Housekeeping distributed in the late 30's - 40's, "Good Housekeeping - Book of Ice Creams and Cool Drinks". At the height of the Depression in the 1930's, Dixie ice cream lids contained movie stars. Even in the Depression the movies were a cheap form of entertainment. Two movies, travel feature, cartoon, News of the World, coming attractions. The movies ran from Sunday - Tuesday, then new movies for Wednesday - Saturday. Dixie did not manufacture the ice cream, but was the company that manufactured the container for many companies. The idea of putting black and white photos of movie stars on the inside of the lid was employed as a marketing tool. The excitement of pulling off the lid to see which star was on the flip side enthralled the fans of the movies. Lids could be mailed in - usually 12 were required to receive a poster of certain stars. But, many were satisfied to keep the lids and not mail away for the poster. Easy to date since not only did the star appear, but their current movie was listed in the information. The Dixie lids ran a different series from 1930 - 1954. During World War II four different series of cards were featured. Each series contained 24 cards. 1941 - Defend America, 1942- America's Fighting Forces, 1943- America Attacks and the 1944 - United Nations at War. Yuenglings Ice Cream had sets of baseball stars. Starting in 1928 Dixie changed the graphics on the cup each year, so the cups are a collectible on their own. Dixie Cup had a radio show: "Dixie Circus" on Friday nights. The interesting fact concerning Dixie Cup - is the company sold the 2 1/2 ounce cups to ice cream companies to put in their own ice cream. That is the reason that the collector finds Dixie Cups with so many different names. But, the Dixie Company was careful in researching to ensure that the ice cream in the cup was of a high quality. Since the Dixie name appeared it wanted to ensure no complaints about the ice cream would be directed at the company. Other companies issued picture cards as premiums in the 1950's. Sealtest Ice Cream a set of 75 cards black and white movie star cards. Each card measured 2" X 3". 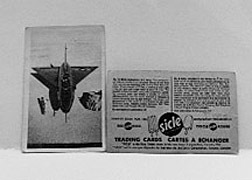 Popsicle issued a series of aircraft and space picture cards. The cards were beautiful paintings of the aircraft or space rocket. One card pictures the Vanguard Rocket on its journey to place a satellite in orbit. The rocket climbs with the earth below. Wrappers containing the ice cream have become objects to collect. The variety is so large. Howdy Doody the famous early television puppet had his own brand of ice cream. The ice cream cups and wrappers that picture Howdy Doody are sought after not only by ice cream ephemera collectors, but toy collectors since this is a crossover item. Howdy even had a ice cream club that offered premiums to his "peanut gallery". Disney's Snow White appeared on a cup. The cowboy stars not wanting to be outdone had their own brands. Hopalong Cassidy was sold in 1950 in a cup, the "Hoppy" cup. But, the real item to search for is the Lone Ranger Comic #1 - 1939 issued in conjunction with the Lone Ranger Ice Cream Cones. There was a premium club as well and even dealer ads are valuable. In fact, the collecting of the ads and cardboard stand ups and store displays has become a hot area for collectors. Most early material is rare in that dealers destroyed or just burned it. Other paper items include the paper hats that the soda jerk wore, wrappers. A sought wrapper from the 1950's was issued by Carvel Ice Cream in the United States. At the height of the "Flying Saucer" craze - the company advertised and sold through its outlets ice cream between two chocolate sandwiches in the shape of a saucer . There were three flavors available, vanilla, chocolate and strawberry. The wrapper pictured a flying saucer swopping through the sky. On hot summer nights in the early 50's the lineups went around the block to purchase a "Flying Saucer", but how many saved the wrapper. Through the years hundreds if not thousands of interesting items have been manufactured, sold or given away as premiums for the consumer and collecting public. During the Depression dishes were manufactured that could not stand alone, but were made to fit into aluminum holders. An entire range of holders and dishes of different types exist. Dishes clear with flowers on the edges to blue dishes. Dark blue or cobalt blue as it is known was a popular colour in the 1930's. Remember those great items that came with Shirley Temple embossed on the dish, pitcher and creamer. Metal spoons were sold or given away that had a dual purpose. The spoon was made of aluminum and was 8 inches long. It was unique to the hollow shaft. The bowl of the spoon was used to scoop the ice cream and then one placed their mouth at the top of the shaft and sucked the soda up. Just like a straw, but much more classy in appearance. A second premium give away set of spoons featured movie stars of the 1920's and early 30's. 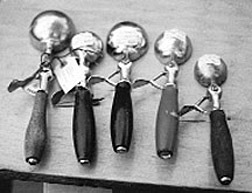 The full size 6" spoons were manufactured by Oneida and feature silent screen stars: Douglas Fairbanks, Mary Pickford, Norma Shearer, Ramon Navarro. The top of the spoon has each star in a portrait and their name underneath. The back features scroll imprinting that is Art Deco. Other collecting areas include the scoops that have been employed to scoop out the ice cream either in the fountain or for home use. Collecting ice cream scoops is an entire area of collecting in itself. In the period of 1878 - 1940 over 200 different types of ice cream scoops were designed, and patented. The "Golden Age of Ice Cream Scoops happened at the same time that electric lights, the telephone, the movie projector were appearing and being patented. History records the first ice cream scoop being patented by a candy and ice cream store owner in Reading, Pennsylvania - William Clewell. He had the V. Clad Company of Philadelphia manufacture his newly patented scoop. It was made of tin and steel. It scooped and the ice cream was released in a pyramid shaped wedge. A rare piece is the "I. Manos Combined Mold and Scoop" - known as the heart shaped ice cream scoop. Manufactured in 1925 by the Manos Novelty Company of Toronto, Ohio. It was patented in the same year. There have been scoops that appear to resemble medical instruments and made of the same steel material. Others have wood handles. One made around 1912 held the ice cream cone in a vise like grip and then was dipped in to scoop the ice cream out. But, the ice cream had to be soft or the cone would be broken. The "Roaring Twenties" saw the greatest number of scoops patented. Since it was the era of flappers, flag pole sitters, airplane wing walkers, ice cream had to join in with the times. In Ontario, the Fisher Motor Company manufactured a pistol-shaped scoop for making "Cold Dogs". The cylinder shaped scoop was pushed into the ice cream, and then the scoop was placed in a chocolate covered pastry shell and what one had was a "Cold Dog". Other scoops were designed for the perfect banana split. The 1920's saw the popularity of the ice cream sandwich. But, unlike today the ice cream had to be fitted at the soda fountain into the two sandwiches. Over 20 different types of square scoops were patented. In this manner the ice cream was scooped out in a perfect block ready to be matted between the sandwich layers. Scoops run the gamut from inexpensive to thousands. In the case of ice cream scoops age is not always a factor. The first one invented by Clewel can be found for very little. Whereas several of the 1920 fad ones can sell in the thousands. An area of ice cream collecting that has been affordable, but is now moving in value is in store or fountain displays, especially the company advertising. Cardboard displays have become popular and in the past were sold cheaply. Usually due to the bulky nature dealers wanted to move the item on. Stores were happy to have one take the cardboard display material away for free. It saved the store the cost of dumpster space. But, in recent years that has changed and collectors have become interested in brand advertising. What better ice cream display than having Elsie, Elmer, and their children filling one's room with an ad for ice cream. In 1933 the ice cream industry went into a panic. The new US President Franklin Roosevelt had brought an end to Prohibition. There was fear that with the return of liquor - ice cream sales would plummet. One idea was an advertising campaign selling ice cream as the perfect "hangover" pick me up. Others were recipes of liquor which including ice cream. "Iced Tea Tango", "Cherry Nectar" and "Comin Through the Rye" - 1 ounce rye - large scoop of vanilla ice cream - fill with ginger ale - stir and then drink. The Ice Screamers Society - organization of individuals and groups interested in ice cream collectibles. Ephemera Society of America Inc. P.O. Box 95 Cazenovia, New York 13035-0095. The PBS network in the US has aired excellent shows on ice cream, soda fountains, road side stands and diners and amusement parks. The shows have been produced by the Pennsylvania PBS network in conjunction with the State of Pennsylvania. Search the web for contact information.